Well this was a test drive with a difference. 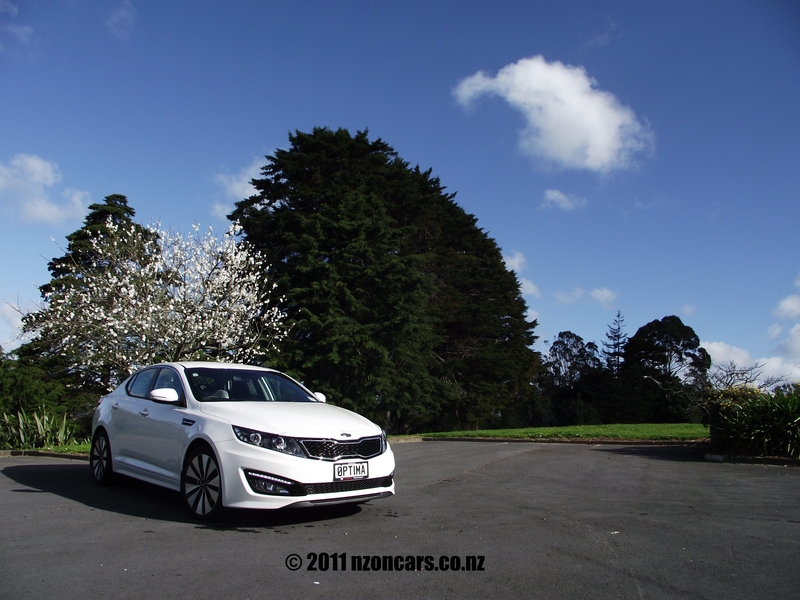 Unfortunately I wasn’t in a position to complete a thorough test as per usual along a typical ‘B’ road out to some fantastic Auckland location with a scenic back drop that’ll help create photo’s that compliment how good the 2011 Kia Optima is. Pretty much the extent of this test drive consisted of heavy motorway traffic after picking the car up, constant trips between home and the hospital thanks to our seven week young son coming down with bronchiolitis, with the odd trip to the day job for good measure, and more motorway traffic taking the car back. The photo’s themselves were a rush job on the way to drop the car off. 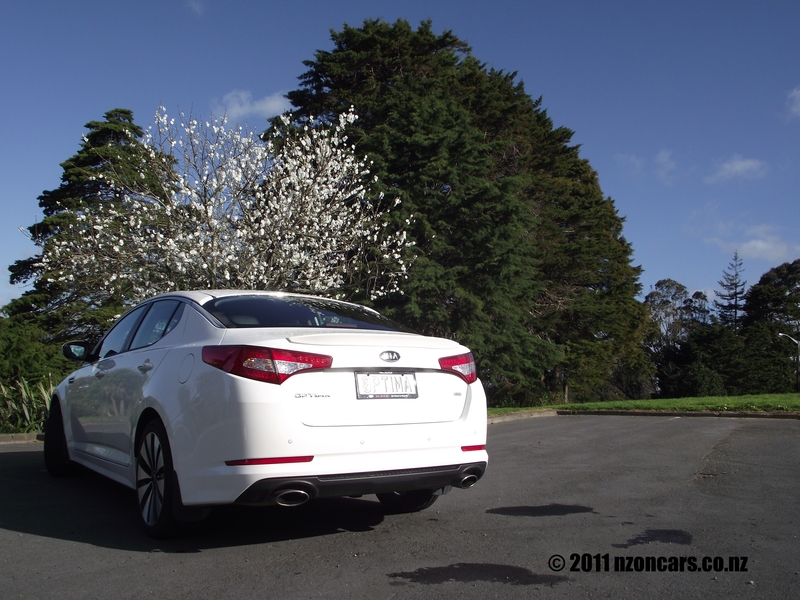 But even with such an unexciting test I was able to ascertain that the Optima is a great luxury car at an incredibly affordable price, considering what you get for your dollars. And what do you get for the $46,990 (+ORC) asking price? As Kia and Hyundai are in bed with each other you get the chassis, 2.4 litre Theta II GDI engine and 6 speed automatic gearbox with sequential manual shift and flappy paddles from the Hyundai i45, but that is where any similarity with Hyundai’s game changer ends. Kia’s very own game changer has a body that creates a muscular stance on the road and turns just as many heads sitting still at one of the many, many, many traffic lights between my house and the Hospital. Whilst we are on the outside lets list the mod cons here. There are the chrome door handles, LED tail and brake lights, boot lip spoiler, LED daytime running lights (every car should have them), projector headlights that shine around a corner as you turn so you have the joy of blinding that drunk staggering down the road causing him to trip over. Oh, and there’s those 18” alloy wheels. 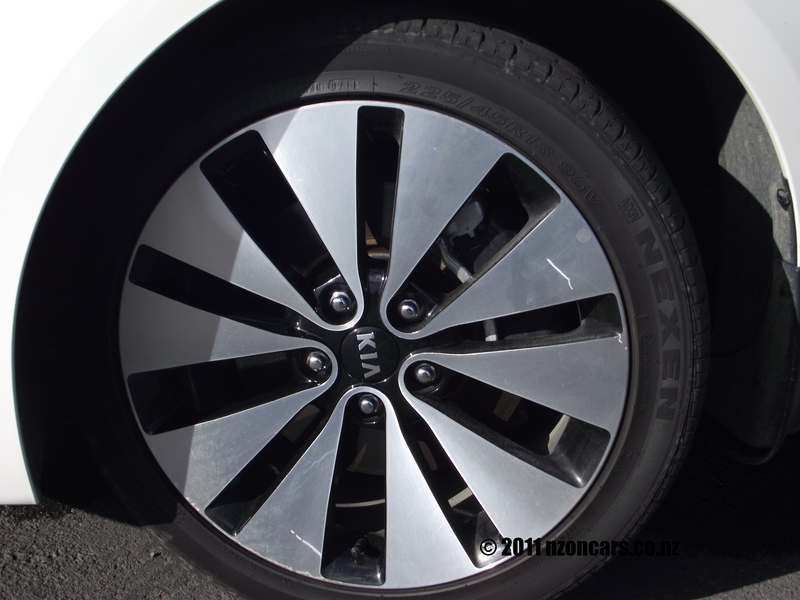 If you think they have come off some concept car you’d be right, Kia Motors had such good feedback from the wheels on the original Optima concept car that they just kept that same wheel for the production model. So glad they did, it just finishes of the exteriors unique style perfectly. Now we move to the inside of the well appointed, sleek Korean, Snow White Pearl painted shell to find an incredibly well equipped cabin, complete with full leather seats including electrically adjustable driver’s seat with two memory settings. Very classy interior mood lighting with subtle red lighting in the front door pockets. A glove box with cooling function to keep those bottles of energy drink cool for that long journey. Dual zone air conditioning which includes sensors mounted on the front windscreen that will almost instantly and automatically defog the windows should things get a little steamy in there. Reversing camera, another safety feature that all cars should have. Sunglasses compartment, rain sensing wipers, hill start assist, trip computer with a colour TFT screen that shows little pictures of your Optima to remind you of how fantastic it looks on the outside. There’s even a picture that comes up when you start the car as a reminder that the front wheels aren’t pointing straight ahead before you drive off embarrassingly over a curb or into the car parked next to you. Then there’s that stereo system. Oh that stereo system. For all those show-offs out there with your heavily hire purchased bass thumping ten thousand dollar systems squeezed into your five hundred dollar lowered Toyota Levin’s or Honda Civics, look out, there is now a factory standard set-up that will also leave other motorists sitting at the traffic lights with headaches. 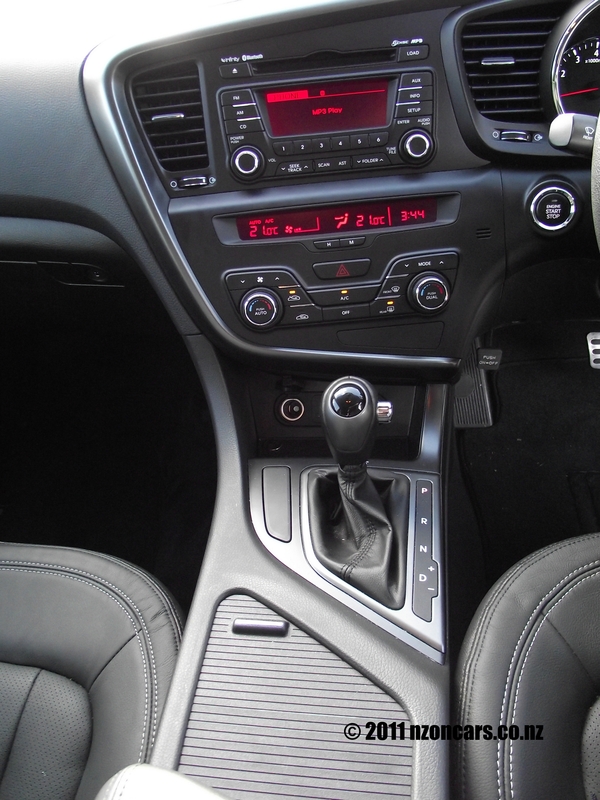 Kia have invested in a great system here with an Infinity 6 in-dash CD changer with a brilliant 8 speaker set-up, including subwoofer, that pumps out an ear drum bursting 530 watts. It also has iPod and USB connections and hands free Bluetooth connectivity which lets you stream crystal clear music from a Bluetooth enabled MP3 player. 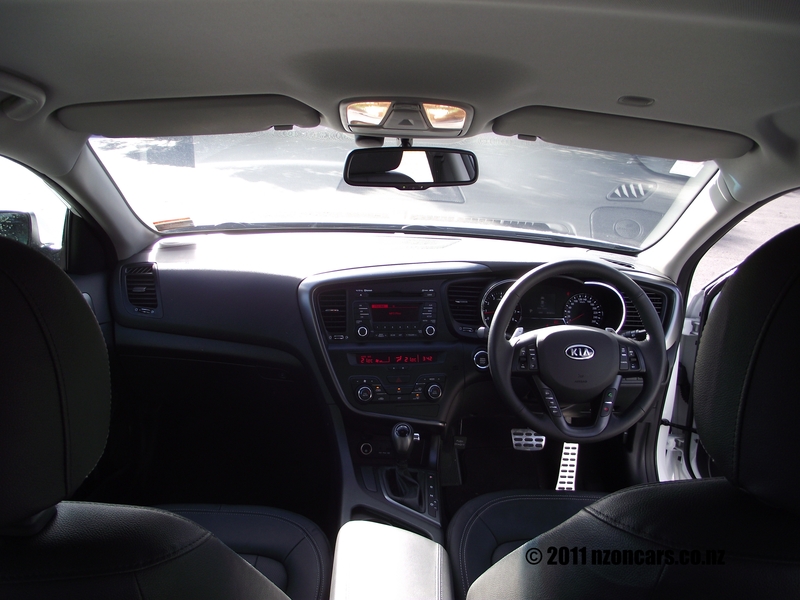 Songs like the Frankie Goes To Hollywood track, Two Tribes, sound amazing in the Optima’s comfy interior. The only failing I could find here, and it’s not really a fault but more of a personal taste thing, and that is the lack of colour on the nicely curved dash layout. A few touches of chrome or brushed aluminum would have set it off nicely. 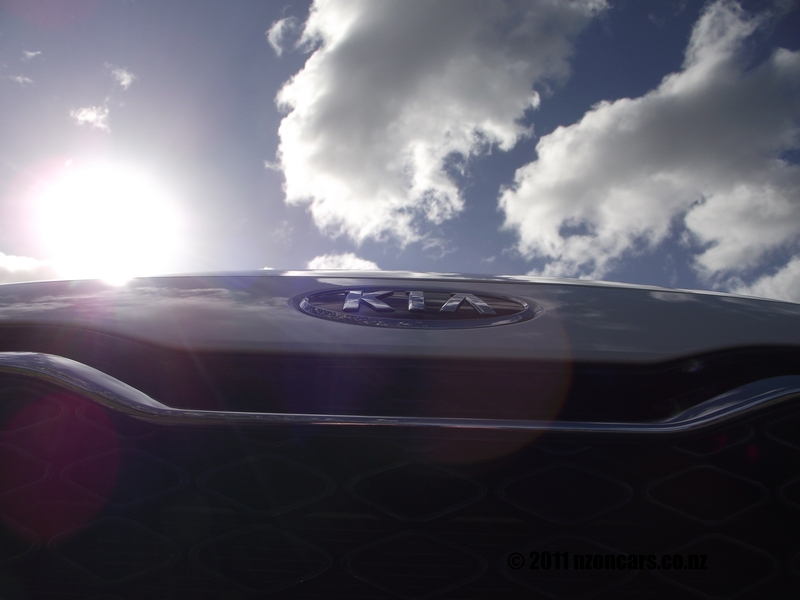 Kia Australasia spent many dollars and hours of testing throughout the South Island of New Zealand and the Australian outback to setup the suspension perfectly for our rough roads and it shows. There was no hint of the floatyness found in the i45 at motorway speeds. It just felt planted, comfortable and safe on the road with only a little harshness over rougher, broken, coarse chip sections but that’s not enough so to spoil the overall niceness of driving such a well assembled, well equipped comfortable piece of head turning conveyance. As for bang for buck this would be hard to beat with an equipment list as long as any top European marquee for only a fraction of the price. The only thing that will put off potential buyers would be the name. If you’re at a party and someone asks you what you drive just after they have told you they have an Audi A4 with all the bells and whistles, your answer is Kia and all of a sudden they are looking for someone else to mingle with before you get the chance to explain that in reality the Kia Optima has everything you want, or need, with enough change left over to buy a few dozen tickets to the Rugby World Cup final. I am slowly getting my head around the fact that cars as good as this are coming from the same maker that bought us the likes of the Magentis (Meningitis as I call it) and Mentor of the late ‘90’s. Yes, didn’t want to use this cliché term, but, haven’t they come a long way!